While doing research for my book, Elvis ’57: The Final Fifties Tours, I discovered that “letters-to-the-editor” were a valuable source of information about the Presley phenomenon in the fifties. Written mostly by people who had very recently seen Elvis perform on stage or TV, such letters provide significant insight into how the general public, especially teenagers, viewed Elvis and the controversy that followed him everywhere he went. A good example is series of letters that appeared in a Denver newspaper in 1956. First, though, let’s take a look at conditions that motivated readers to send letters about Elvis to their local newspapers back then. First of all, we all know that Elvis first burst on the national scene as a result of a series of network TV performances early in 1956 on Stage Show, hosted by the Dorsey brothers. However, his notoriety built slowly through the first five months of that year. Although he toured constantly, in the early months of 1956 local newspapers rarely deemed his appearances in their towns worthy of print coverage. In April and May, sporadic reviews of his stage show started to appear in some papers, but usually only in the inside entertainment section. It wasn’t until after his infamous pelvic performance of “Hound Dog” on the Milton Bearle Show in early June that an Elvis appearance became front page news in nearly every community he played from then through the end of 1957. It’s important to understand that letters-to-the-editor surfaced only after newspapers printed negative reviews of Elvis concerts. Such articles raised the ire of young Presley fans, causing them to do two things they normally didn’t do—read the newspaper and write letters of protest. If local papers didn’t cover Elvis’s appearances in their communities, as they usually didn’t in the early months of 1956, there was no motivation for Elvis fans to send letters to the publisher. The very first sizable group of letters-to-the-editor about Elvis began to appear in the Rocky Mountain News on April 11, 1956, three days after Elvis played the Denver Coliseum. The letters, and some phone calls, were aimed at Frances Melrose, a News writer, whose regular column usually appeared in the paper’s entertainment section. “Rage Over Elvis Presley Is a Bit Sickening” was the provocative headline above Melrose’s review on page 27 of the April 10, 1956, edition of the Denver paper. “There’s a new rage of the age—Elvis Presley,” noted Miss Melrose. “As far as I’m concerned I hope this rage passes into oblivion as quickly as it has sprung up.” Several paragraphs later came the passage that undoubtedly sparked a deluge of antagonism toward her from Denver’s Elvis fans. 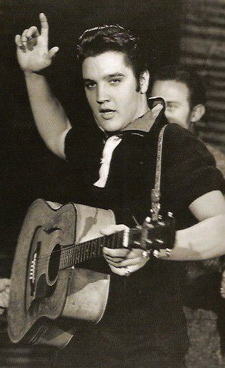 “It’s a toss-up which was worse, Elvis or his fans,” Melrose wrote. “I’d say the edge goes to Elvis. To criticize Elvis was one thing, but to openly put down his young fans was asking for trouble. Still, Melrose was apparently taken by surprise when her phone in the newsroom began ringing off the hook that very afternoon. Nearly all the callers disagreed with her assessment of Elvis. Most did so politely. However, in her column the next day, Melrose chose to feature an anonymous caller, who commented as follows. It’s understandable that some of Elvis’s teenage fans reacted passionately to Melrose’s criticism of their favorite, but such name-calling only helped to strengthen the conviction of Melrose and other anti-Elvis journalists at the time that Elvis was a harmful influence on teenagers. On April 13, Melrose printed portions of 21 letters and phone calls as “samples” of those she had received in just the past two days. “The hurricane stirred up by my column on Elvis Presley continues to ricochet around my ears,” she explained. Among the printed messages she had received were many insulting comments aimed at the News writer. Some examples, bad grammar and all, follow. "There’s a new rage of the age—Elvis Presley," noted Miss Melrose. "As far as I’m concerned I hope this rage passes into oblivion as quickly as it has sprung up."